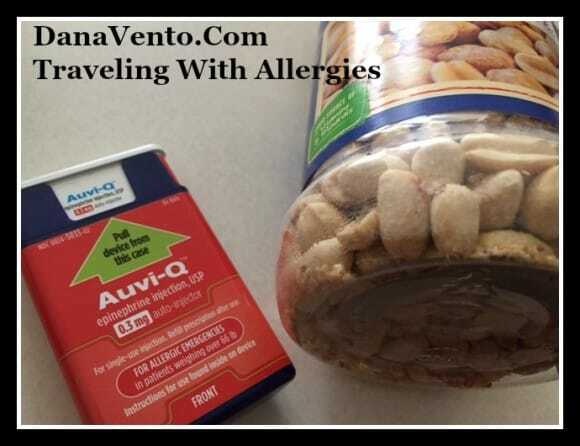 It’s tough traveling with an allergy and it’s harder when you can’t get peanut free accommodations because you never know what you will be up against or how the person with the allergy to the food may react. When your life is at risk or your child’s life, you try to plan, pre-plan and then over-plan to not expose yourself or them to any associated risks with the known allergens. What is tough is the unknown, the air, and what others carry food-wise as you are not in control of all of these factors. However, when you can control moderate risks, you actually can take charge and attempt to fend off any potential problems. My latest trip has us planning the trip step-by-step as we fly, travel by ship and drive all over the east coast and out of the country, but I can tell you flying has not made the trip easy! Our son has multiple life-threatening allergies that we work with on a day-to-day basis, but in regular life, we have a schedule and a way to work around them as his stops are ordinary. While we are traveling we are going to be in different areas, places and environments so my attempt to control what I can is definitely in overdrive as it should be, I am his advocate and I want to make sure his trip is as enjoyable as mine! Here’s my insight on flying with Delta vs. flying on American Airlines as to who has the better nut-free policy. There is no way to really make the zone nut-free for our son, but DELTA offers a few accommodations to attempt to work-around the allergy. Don’t make a mistake, this is not a NUT FREE ZONE, but DELTA is willing to try to accommodate and make a difference for those flying with nut allergies. First things first, once you make your reservation or are making your reservation, call DELTA and advise them of your or your child’s allergy. They make special notes. Here are their specific policies, which offer some insight on how much they can or can not do to help you out. The fact of the matter is, someone before you could have sat in your seat, eaten nuts and touched the seat, the lights, the fan, etc. and everything can be contaminated, in addition the air vents recirculate air so its a crap shoot. Second when you get to the gate, talk to the attending staff and let them know you are there, you will be able to pre-board. When you pre-board, bring wipes and take care of business(I do), however, this does not control what the people next to you, behind you and in front of you are eating. That said, if it they consume nuts and your allergy is severe, there is not controlling their eating habits. My concern is more when the heat is on while in flight and the air starts to recirculate and anyone eating nuts will have the smell intensified. Nuts particulates and smell become airborne, but there is no cure for this and you understand this when you sign up for a flight…ugggggg. Finally, once you advise DELTA of nut allergies, they will refrain from serving peanuts and peanut products in the sky. This is about as accommodating as it will get, so be glad you found DELTA. I am so upset with American Airlines, but we had to book this flight as there were no other flights available to accommodate all of us in my party. We did not want to split up and fly separately so now we are paying the price. We could not get so many of us on a flight and we booked last minute, therefore, we could not fly on Delta for our flight back and WOW am I upset. This is like self-induced punishment because they don’t care! For such a large carrier, American Airlines aggravates me at their lack of care and compassion for those with nut allergies. They don’t serve nut-free foods and they serve nut mixes on board. Again, we can’t control what others do, so we can’t get into what other passengers may have, just as on DELTA, but trying to create a barrier from what we can control on American Airlines is like a disaster. You are so wonderful…NOT! You are also reminded that there are regular cleanings but that the air filtration systems do not remove nut allergens. We are encouraged to take the necessary medical precautions because they can not provide nut-free zone, pre-boarding or accommodate specific requests to not serve nuts– jeez.. I think American Airlines You are NUTS.. Do you recognize how many people in this world have nut allergies and you don’t seem to care? No pre-boarding for us to at least wipe down the seats, table trays, etc? Nothing? You have to be kidding me that you are this heartless. We are not asking to change what others bring, just to try to create an area where it is possible to at least fly and you won’t work with us, this is awful! Here’s the difference in a Nut Shell(lol) pun intended: Delta will at least attempt to modify what it can not change permanently. Delta offers the pre-boarding, a seat cleaning and they are willing to cut all nuts on that particular flight when notified ahead! Thank you Delta for helping us attempt to defeat a potential problem before it happens. Conversely, American Airlines, does not give a peanut shell(oh that’s right they do give peanuts, my bad) as to how your flight is if you have an allergy. They won’t NOT serve(great English, but sense the frustration here) nuts or anything that nuts might come in and they make NO accommodations whatsoever. Here’s my thing, perhaps their CEO and their families have no health issues, but when they do, I bet they get on their soapbox or should I say nutshell(lol) and makes changes! Just saying…… We will have our EPI Pen, Benadryl, Wipes and Steroids ready. However, I just hope we never have to use them on the flight, how shelled up would that be? This is my personal tale of lavishly living food allergies out loud and my personal disgust with American Airlines less than appropriate accommodations while flying with nut allergies. Thank goodness there is an option.. Delta because American Airlines won’t be seeing us again! While there is no way to fly absolutely nut free, Delta is leading the way to traveling. I can only imagine how frustrated and worried you are at the same time. I hope your flights are uneventful and wish your family safe travels. Thanks – It was a safe flight. No Peanuts. Other than this guy.. who decided when they announced no Peanuts will be served on this flight he said,” He’d like to start just chucking peanuts at the person who has the allergy because they used to do that to his cousin and watch him swell up” He then added it was ridiculous that anyone should be able to alter his snacking on nuts — and he called the guy next to him Shrek. So he was pretty much an all around MONSTER himself.